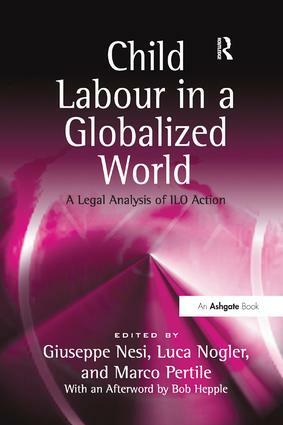 This volume examines the legal dimension of the ILO's action in the field of Child Labour. The authors investigate the implementation of the relevant legal instruments and assess the effectiveness of the ILO supervisory system. All relevant instruments are considered while particular attention is given to Convention 182 on the elimination of the worst forms of child labour. Child Labour in a Globalized World describes the ILO's activities concerning the eradication of child labour whilst assessing and evaluating the effectiveness of the relevant legal framework and functioning of the supervisory system. This book contextualizes the issue of the eradication of the worst forms of child labour in the recent doctrinal debate on the nature of labour standards and the transformation of the ILO. This important work will be a valuable resource for academics, researchers and policy-makers with an interest in labour law, international law, and children's rights. Giuseppe Nesi is the Legal Advisor of the Permanent Mission of Italy to the UN in New York, USA. He is also Professor of Law at the University of Trento, Italy, and editor of The Rome Statute of the International Criminal Court. A Challenge to Impunity (2001) , The International Criminal Court and the Crime of Aggression (2004), and International Cooperation in Counter-Terrorism (2006) all published by Ashgate. Luca Nogler is Full Professor of Advanced Studies in European and Transnational Law and Head of Department, Faculty of Law, University of Trento; Marco Pertile Lecturer in International Law, School of International Studies, University of Trento, Italy Luca Nogler is Full Professor of Labour Law and Director of the Department of Legal Sciences at the University of Trento. He has published a wide range of books and articles in the areas of Employment Law, Labour Law, Comparative Labour Law, Jurisprudence, and History of Labour Law. He lectured as Visiting Professor in a number of European Universities such as the University of Bremen, the University of Berlin, and the University of Salamanca. Marco Pertile is Lecturer in International Law at the University of Trento. Previously a Visiting Researcher or Professional at the Max Planck Institute for Comparative Public Law and International Law (Heidelberg), the ILO (Geneva), and the International Criminal Court (The Hague), he has published in the areas of International Law, Human Rights Protection, and EC Law.